Physical strength and stamina: Electricians may need to move heavy equipment and be on the move all day. Color vision: Electrical wires have different colors, so it is crucial that electricians are able to identify and distinguish wires by color. Troubleshooting and repairing: A big part of the job as an electrician is to find, diagnose, and repair problems. Customer service skills: Like in many industries, you deal with customers. Being able to properly communicate and respond to their needs and answer questions is crucial. Critical thinking: Along with troubleshooting, testing and finding solutions to repair an issue is important. Business skills: This is primarily for those who want to work for themselves. 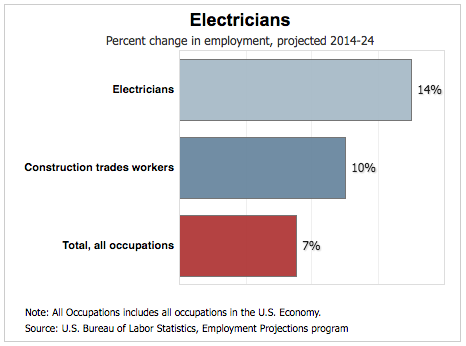 Electricians need to find jobs to bid on and preparing a budget for a bid. While on the job, keeping track of inventory and assigning tasks are components. Mechanics: Electricians use a variety of tools and machines, so they needs to know how to use, repair, and maintain them. Mathematics/Basic Grammar: Basic math skills including arithmetic, algebra, geometry, calculus, and statistics are required, as well as being able to communicate effectively. Design: Electricians work with precise technical plans, blueprints, drawings, and models, so they need to be familiar with the techniques, tools, and principles used in these designs. It is a good idea to start developing these skills while you are still enrolled in your vocational training program. The role of an electrician can be complex, but you will likely need all of these different on-the-job skills, general character traits and technical skills in order to succeed in this growing field. Remembering to hone both your technical and “people” skills will likely increase your chances of getting ahead in your electrician career.